Pictured: Barcelona, Spain’s bicycle sharing system, Bicing. Bicycle-sharing schemes have experienced a rapid global expansion throughout the past decade, likely outpacing growth in every other mode of urban transport. Photo by IluriPhoto/Flickr. Peter Midgley joins us as this week’s author for the “Sustainable Urban Transport On The Move” series. We invited Peter to share his vast knowledge on bicycle sharing gained through his experience tracking the growth of bicycle sharing systems since 2007. Peter formerly worked as the Urban Mobility Theme Champion for the global Transport Knowledge Partnership (gTKP), before which he worked at The World Bank for 25 years. In the past ten years, bicycle-sharing schemes have evolved at an astonishing pace, growing from interesting experiments in urban mobility to mainstream public transport options in cities as large and complex as Paris and London. Thirteen years ago, there were a mere six schemes operating in six countries – Denmark, France, Germany, Italy, Norway, and Portugal – with a total fleet of just over 4,000 bicycles. The largest of these schemes was Copenhagen with 2,000 bicycles. As shown in the map below, today there are an estimated 639 bicycle-sharing schemes operating in 53 countries located in almost every region of the world, boasting a total of about 643,000 bicycles. Global bicycle sharing countries, systems, and fleet by region. Click to enlarge. Graphic by Peter Midgley. The graphic below displays the rapid growth bicycle-sharing has experienced, which has likely outstripped growth in every other form of urban transport. This is especially the case in China, where two systems with a combined fleet of 2,700 bicycles in 2008 quickly escalated to 81 systems with a staggering combined fleet of nearly 440,000 bicycles – a figure that accounts for over two-thirds of the global fleet. To put that growth in perspective, in 2008 the largest bicycle-sharing system was Paris, with 20,000 bicycles. Five years later, Wuhan, China now has the largest bicycle sharing system in the world by far, with an estimated 90,000 bicycles. 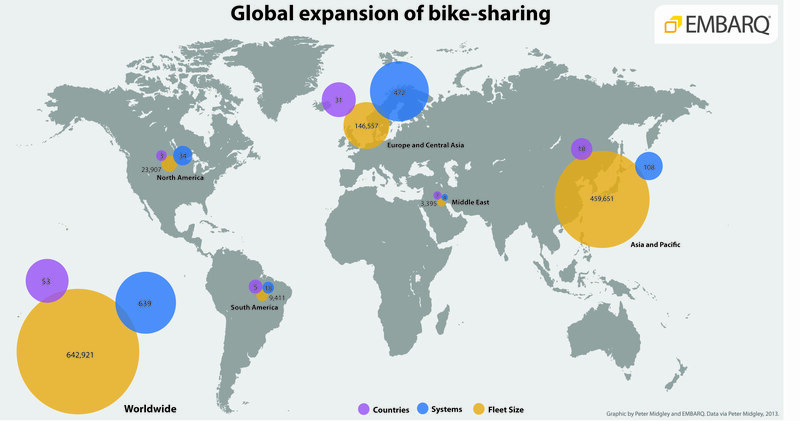 Growth in Global Bicycle Sharing Systems and Fleet. Graphic by Peter Midgley. Bicycle-sharing schemes are not only attractive; it would appear they are also highly adaptable to different types and sizes of cities. Bicycle-sharing schemes have been developed in large metropolitan areas as well as medium-to-small towns with systems of only about 50 bicycles. 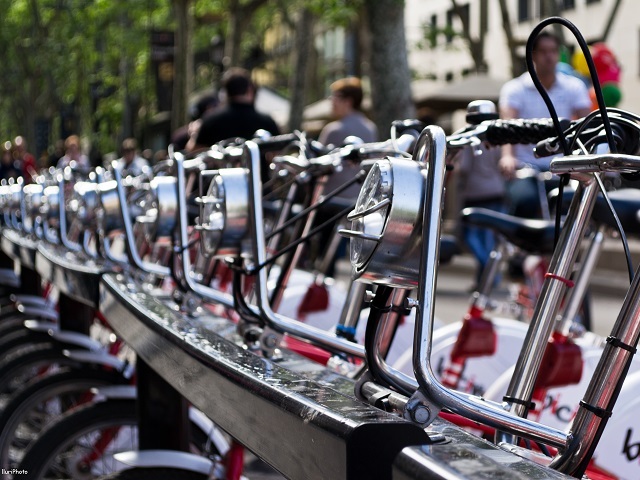 In fact, the largest concentrations of bicycle sharing systems are located in Italy and Spain, which have the most cities with bicycle-sharing systems at 124 and 93, respectively. Bicycle-sharing schemes have evolved dramatically since the first schemes were introduced in Amsterdam, the Netherlands (1965), La Rochelle, France (1976), and Cambridge, England (1993). With the exception of La Rochelle, these early schemes were closed due to vandalism and theft. To address these issues, “Second Generation” systems began launching in 1991, first in in Farsø and Grenå, Denmark. By 1995, the first truly large-scale scheme was introduced in Copenhagen, Denmark. Second Generation systems were “bicycle lending libraries” with a membership or annual fee. They used custom built, heavy duty bicycles with non-standard components, or specially designed parts that couldn’t be used on other bikes and therefore were impossible to sell, to reduce theft. They were relatively simple and cost little to install, often used manual tracking of bicycle rentals, and most included multiple rental and return locations with coin operated locks. Although they were more dependable, the introduction of smartcard technology in the late 1990s ushered in a “Third Generation” approach that has enabled bicycle sharing to become what it is today. The first scheme to use smartcard technology was introduced by Clear Channel in 1998 in Rennes, France. Other systems followed soon after, including Lyon, France’s scheme in 2005, and the famous Vélib’ system in Paris in 2007. These “Third Generation” systems used improved bicycle designs, sophisticated docking stations, automated smartcard bicycle locking, and smart card payment systems. Some introduced GPS systems to track bicycles and prevent theft and nearly all used websites to provide users with real time information on bicycle availability. Most were public-private partnerships developed and operated by major advertising companies, such as Clear Channel, JC Decaux, and Comunicare. In almost every case, the companies provided and operated the systems in exchange for free billboard advertising. Current “Fourth Generation” schemes include design innovations such as movable and solar powered docking stations, electric bicycles also known as pedelecs, and mobile phone real time availability. Of these features, the introduction of electric bicycles is particularly significant in terms of enabling bicycle sharing in cities with steep terrain, as well as attracting older users. In Fourth Generation schemes, the dominance of advertising companies is less evident and operators now include a variety of business ventures including companies like PBSC Urban Solutions, a spin-off of Montreal’s parking authority that developed the London and New York bike share systems. Unfortunately, it’s not all good news in the world of bicycle sharing. 59 systems have closed in the past year alone, many of which were located in countries like Spain that were particularly hard hit by the global financial crisis. But we’ll discuss this and other challenges to the global scaling-up of bicycle sharing systems in future blog posts, diving deeper into the world of shared-use mobility.